Our mission is to educate responsible citizen-scholars for success in the college of their choice and a life of active citizenship. Founded in 2005 and opening our first school in 2006, Democracy Prep set out to prove what is possible for public education in America. Our flagship school, Democracy Prep Charter Middle School, first opened its doors in August 2006. By 2009, DPCS became the highest performing school in Central Harlem and was ranked the number one public middle school in New York City. 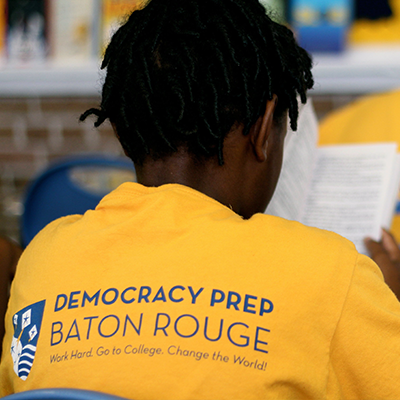 Democracy Prep Public Schools currently operates 21 high-performing schools and one program in New York, New Jersey, Baton Rouge, Las Vegas, and San Antonio educating 6,500 citizen-scholars. The incredible growth of the scholars is possible through the tireless and dedicated work of the educators who make up our DREAM Team. By proving that students, regardless of what ZIP code they are born into, can perform at high academic levels, we seek to transform not only the lives of the students at Democracy Prep but also the expectation of what public schools can achieve. The Democracy Prep model is built on the best practices of high-performing charter networks nationwide. Our framework exists to remind us all that we have no excuse for failing to educate our scholars. These networks have proven for more than 20 years that demographics do not determine destiny and that low-income students can be successful in the college of their choice. All Democracy Prep scholars attend academic classes for at least eight hours each day for 190 days each year and are offered additional summer and Saturday academies for extra support. Should a scholar attend Democracy Prep from kindergarten through graduation, he or she would receive more than six years in additional educational time than students in the average traditional public school. 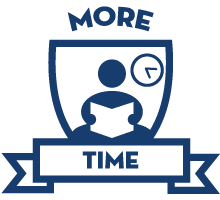 All scholars study two hours of math, three hours of literacy, one hour of science, and one hour of social studies every day as well as art, theater, music, health, and physical education. In our high schools, Korean language, speech and debate, a cappella music, and AP courses are offered to all students. 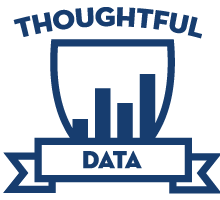 Democracy Prep utilizes a sophisticated feedback loop of frequent data collection and analysis including a network-wide dashboard tool, interim assessments, and comparative academic measures to drive effective instruction and decision-making. All Democracy Prep staff and students live by the “DREAM” values of Discipline, Respect, Enthusiasm, Accountability and Maturity. DREAM values guide classroom behavior and professional culture, and are reinforced through a variety of earned enrichment opportunities and positive incentives, such as field trips, dining out, and special privileges. 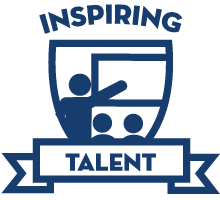 We are committed to attracting, developing, and retaining exceptional adults to work in and for our schools. Democracy Prep staff members undergo extensive performance reviews, receive weekly professional development during the school year and three weeks of intensive professional development in the summer, and are guided by explicit career ladders and opportunities for growth. In order to be a proof point for what public schooling can and should, Democracy Prep does three things that set it apart from other high-performing charter networks. Much has been said about the achievement gap, which Democracy Prep strives to close every day. However, very little is said about the “civic achievement gap.” National testing, academic studies, and political polling show that low-income, people of color are far less active participants in our democracy. We believe that all public schools should place an explicit focus on preparing scholars to become active citizens and leaders in our democracy. 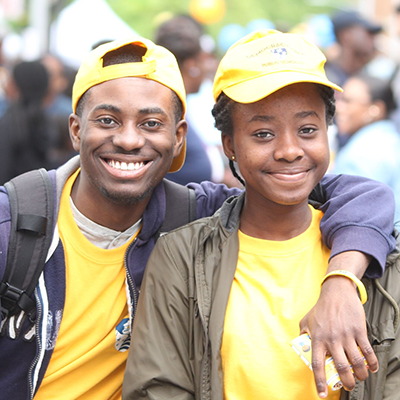 Through civic initiatives, community engagement, speech and debate, and authentic student and family advocacy for more school choice, our scholars acquire the knowledge, skills, and attitude to change the world. 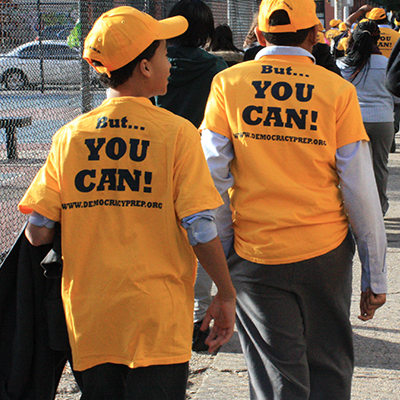 Each Election Day, elementary and middle school scholars run our “Get Out The Vote” campaign, standing on busy street corners wearing t-shirts and handing out flyers that read “I Can’t Vote, but You Can!” Since its inception, the campaign has encouraged thousands of Harlem, Camden, and Baton Rouge resident to get out and vote. Our scholars are the youngest in history to testify in front of the New York State Senate and Assembly, and the New York City Council. We actively recruit students who are the least served by traditional public schools and other charter operators, including English language learners and special education students. 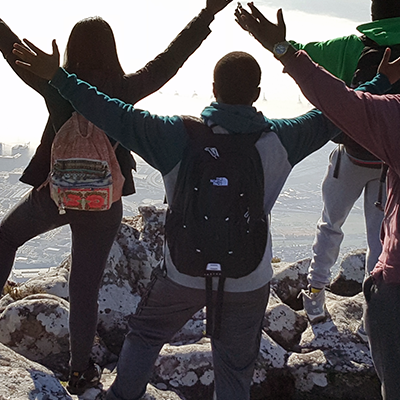 We provide these students with the same transformational education and support that we provide to all our students including all elective offerings. In addition, just like a traditional public school and unlike many charters, we welcome new scholars at all grade levels at the beginning of each year. This provides students who have previously been left behind with the opportunity to embark on the path to college and civic success whenever there is an available seat at Democracy Prep. Democracy Prep funds all of its schools with only the public money we receive from the city, state, and federal government. Failing districts often use resources in a manner that runs counter to the evidence about the practices that most improve the effectiveness of teaching and learning in the classroom. Democracy Prep efficiently spends money as close to the student as possible, spending the most on great teachers and much less on its comparatively lean administration. Democracy Prep also seeks private philanthropy for strategic initiatives separate from the running of its schools, including private facilities’ costs and alumni support. 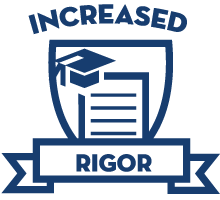 These initiatives are essential for the replication of our schools to serve more students, promote education reform, and share promising practices with the broader education community. In the fall of 2012, Democracy Prep Public Schools received a generous grant from the U.S. Department of Education to open 15 additional schools. Subsequently, using its successful Harlem model as a starting point while accounting for key operational and cultural distinctions, Democracy Prep opened thousands of high quality public school seats in Camden, the South Bronx, Baton Rouge, and Las Vegas. In 2016, DPPS received a second round of expansion funding from the federal government along with a mandate to educate over 10,000 scholars by the end of the 2020-21 school year. Accordingly, Democracy Prep will continue to explore opportunities to partner with communities looking to expand the availability of high quality public school options for low-income students.